Last year, we enjoyed a wonderful evening at Disney on Ice. 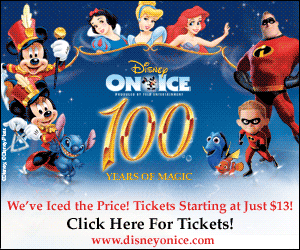 A new Disney on Ice show is coming to Phoenix in April, and I'm excited that we'll be there again! Tickets go on sale tomorrow (February 27) at 10AM for the shows on April 1 - 4, 2010. If you're in Phoenix, you can use the discount code "MOM" to purchase 4 tickets for only $44! Additional tickets can be purchased for $11 each. I'll have more details soon, but I wanted to share the code right away! I first tried Wanchai Ferry meals when I visited General Mills last year. They are a 2 serving bag of Chinese food -- easy to make and tasty as well. I have to buy 3 bags to feed my entire family, but they are a great option when just Bo & I need a meal. I really like the fact that the meals include rice, meat and vegetables -- so the only addition necessary is maybe a side salad! 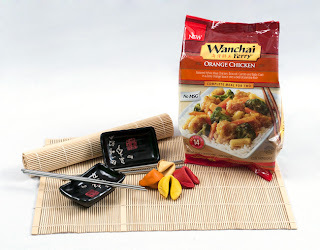 There are 5 meals to choose from -- Orange Chicken, Shrimp Lo Mein, Spicy Garlic Chicken, Sweet & Sour Chicken and Sweet & Sour Shrimp. Visit Wanchai Ferry to print a $1.50 off coupon of your own. Fill out the form to enter your chance for the great package noted above. For the required entry, let me know your favorite Chinese food / meal. Extra entries if you share this post on Twitter, Facebook or your own blog! Winner will be chosen March 6, 2010! Disclosure: The product, prize pack, information, and giveaway have all been provided by WanchaiFerry through MyBlogSpark. For Wordless Wednesday, I posted this picture of a spider monkey. Last week, we visited the zoo with my brother & his friend. 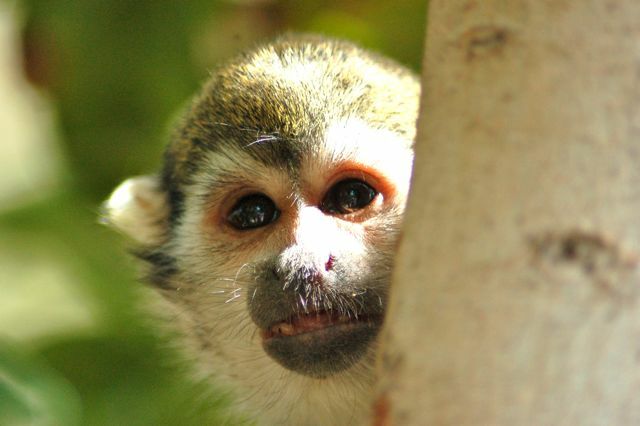 At the Phoenix Zoo, you can go inside the large caged enclosure where the spider monkeys live. It's an awesome exhibit, and allows you to see the wild spider monkeys up close! I did use my zoom lens to get that shot, but there was no cage separating us! 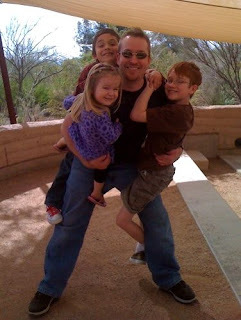 And here's a shot of my own personal monkeys -- thrilled that their Uncle Matt was in town! I recently chose to begin saying a daily family rosary again. We had fallen away from the habit during my pregnancy with Lydia, and I missed that consistent family prayer time. Lent seemed a good time to start up again, and I'm happy to say that it is going well. What amuses me is how we go about it. We say the rosary in the evening, right before we tuck the kids into bed. I purchased a CD from the Poor Clares of Perpetual Adoration and loaded into iTunes. Then, we connect to my iTunes through our XBox360 (using Connect360 since I have a Mac) and listen to the audio through our TV sound system. Who would have thought a gaming system would have made our family rosary easier? Of course, we could just say the rosary, but the CD helps us keep track and I don't lose count of prayers when Lydia needs help or redirection. As I mentioned before, I really like this CD because the prayers are not muddied with music. Everyone is happy and willing to spend this time in prayer, and I feel almost foolish that it took so long to come back to the habit. Lydia is content to putter around us while we pray, but I know that it is sinking in. As another advantage, the boys seem more calm as they head to bed each night. I was excited to see the recent study published in the New England Journal of Medicine that found a genetic link to stuttering. This study validates the opinion of some that bad parenting, environment, or anxiety are NOT primary causes to stuttering! (This article at ABC News explains the study well.) It also gives me scientific ammunition to share with those who would like to assume that Nate stutters because our boys are so close in age, or that I'm a bad mom, or that we cause him stress which results in stuttering. In reality, nobody is quite sure why kids stutter -- but this recent study provides some solid information that there is often a genetic component. As far as Nate's progress, he is doing great! I have noticed that he is aware of his own stutters more often and uses the tools he's been taught to either stop, or start again, his speech. We don't stop him each and every time, but we do stop him much more often than we did in the past. We don't embarrass him, or bring attention to it in front of others -- but we do encourage him to take control of his speech by using the tools. Learning about the speech machine, and how all the parts work together has not only helped him but also me! When I begin to stumble over words while teaching, I find myself thinking of the speech machine and the tools Nate has learned in order to help me put myself back on track. In addition to practicing his speech, he has also been working on a presentation about stuttering during his speech therapy sessions. It's in the rough draft stages now, but when it's completed in a month or so, he'll have a booklet to go along with a spoken presentation to share with others who are interested in learning more about stuttering. He has moved from practicing single words to practicing phrases. After phrases will come full sentences. He's doing an excellent job so far, but we know that it will take plenty of effort for him to regularly speak smoothly, and he will probably always work against stuttering when he speaks. I did notice that he suddenly began stuttering quite a bit again, but it corresponded to a growth spurt. After a couple weeks, the progress he made prior to the setback had been made again. 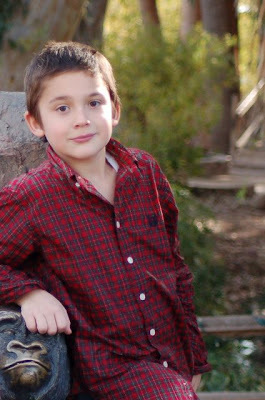 There are less than 3 months left in this school year, and I am eager to see his continued progress. 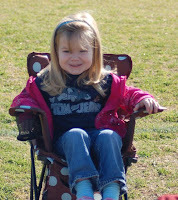 Last week, my Wordless Wednesday photo showed Lydia at a soccer game, in this chair on the sidelines. 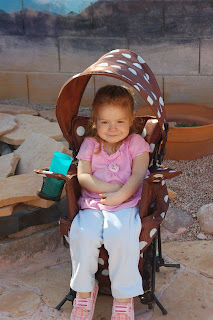 It is a Kristi G Go and Grow Chair -- which we have used countless times since receiving it. You can't see it in these pictures, but the chair has a five-point harness which makes it easy to use for infants. As the child grows and begins to stand, there is a basket underneath which allows the child to safely stand (while strapped into the five point harness.) We use the basket to hold the carrying bag and un-needed jackets, water bottles and snacks while on the field. I don't have to worry about those things blowing away! A snack tray easily slides onto the arm rests to provide extra security and a handy place for snacks. Drink holders are on the arm rests as well. It's comfortably padded and extremely sturdy! 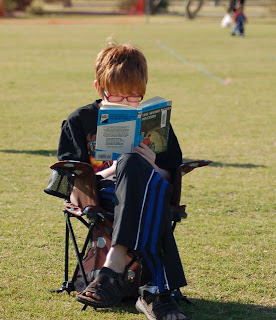 The legs are designed in such a way that the chair will not easily tip over -- even when set up on the un-level soccer field. And -- one of my favorite features is the removable sun bonnet. This sun bonnet folds and fits into the canvas bag easily so that it is always available. In the Arizona sun, this is a welcome addition! This chair is very well-made and I can see getting years of use from it. If I had it 2 years ago, I would have used it during every sports season! I know it will get plenty of use this year, and in future years. You can see that Lydia fits perfectly -- and even Colin (9yo) looks comfortable reading his book while sitting in this chair. The chair was designed by a mom of 5 who believes in simplifying when possible. She designed a neat diaper bag (watch for review soon) and then conceived this wonderful chair to make outings simpler with her children. She wants to make parenting a little bit easier with her products -- and I think she has definitely succeeded with these products! You can purchase the Go and Grow Chair through Amazon or at the Kristi G website. Watch the video below to see the chair being used by different ages. Disclosure: I purchased this chair for review. My boys have decided to raise money to donate to Heifer International. Over the next 6 weeks, they will be keeping track of their reading. They started today (February 21, 2010) and their fundraising ends Easter Sunday. Nate would like to provide a Flock of Hope for a family, and Colin would like to purchase a share of a Milk Menagerie for a family. If they raise more than their goal, the additional funds will go towards purchasing honeybee hives and shares of a pig. They have been asking for sponsors for every 50 pages (or one book) that they read and are hoping to raise at least $160.00. Some of their sponsors are paying them based on how much they read, while others have donated a flat donation in exchange for their reading efforts. They are excited to know that they currently have 7 sponsors helping them reach their goals. Let me know if you want to help them reach their goals! I'll be posting weekly on their progress. If you want to make a one-time donation, you can use PayPal, or contact me for mailing information. I've written about how much Lydia loves to sing and dance. She also loves anything Barbie, princess or pink. When Mom Central asked if I'd like to review the DVD, Sing Along With Barbie , it didn't take me long to say "Yes, Please!" 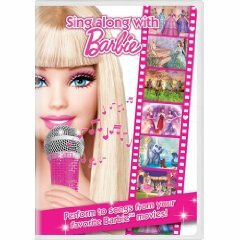 Sing Along With Barbie features clips from various Barbie movies where the characters sang. It also includes words along the bottom of the screen -- which wasn't of interest to Lydia yet, but her brothers found it mildly interesting. Lydia (almost 3yo) enjoyed this DVD, but was a bit confused by the fact the stories didn't continue and were just snippets from some of the DVDs she has watched in the past. I think the confusion was increased by the speaking that was included with some of the songs, since there was no editing of the song snippets that were pulled from existing movies. She prefers watching Barbie and the Three Musketeers over this DVD, but as she gets older she may enjoy it more. Disclosure: I wrote this review while participating in a blog tour campaign by Mom Central on behalf of Mattel. In addition, I received a gift certificate to thank me for taking the time to participate. 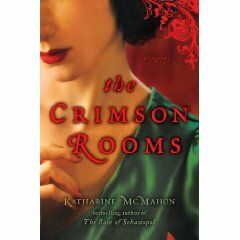 Through Mother Talk, I had the chance to read an advance copy of The Crimson Rooms by Katharine McMahon. The book is historical fiction, which is a genre I thoroughly enjoy. The Crimson Rooms did not disappoint! It's a mystery (another genre I enjoy!) set in the 1920's. The story is about a young female lawyer, a young boy, his mother, and his deceased father's family. I won't spoil the plot, but it was interesting and full of twists and turns that I didn't anticipate. I found the book well-written, with developed characters and plenty of detail about England after WW1. It's about family dynamics, and legal drama, and mystery. It is quite a delightful book, and one that I would recommend. The book is published by Penguin Publishing, and can be purchased from their site in both hardcover and e-format. Disclosure: I wrote this review while participating in a blog campaign by Mother Talk on behalf of G.P. Putnam's Sons / Riverhead and received a copy of the book to facilitate my candid review. Mom Central sent me a gift card to thank me for taking the time to participate. Here's our little cheerleader! 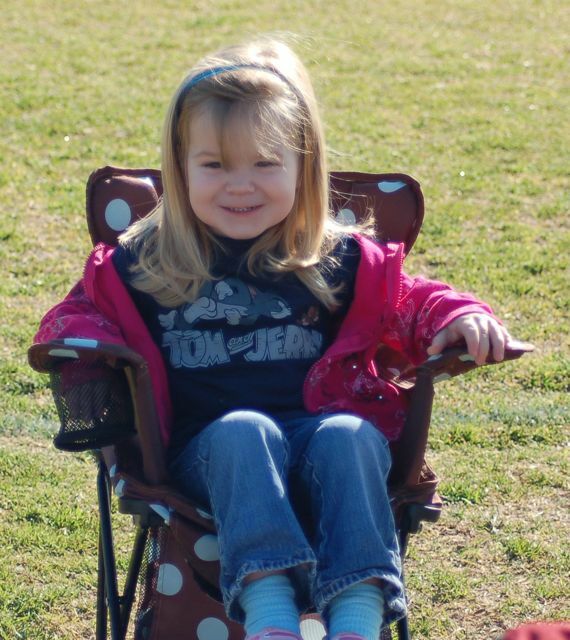 She loves going to her brothers' games and cheering them on from the sidelines . . . when she's not trying to run out on the field and join in the fun! She's always ready to cheer the team on, and does her best to keep track of the action. I love how eager she is to always congratulate them on a job well done. She usually attends speech therapy with me & Nate, and last week as we walked out of the room, she said "Good job today, Nate!" as we headed to the car. He said "Thanks, Lydia!" and she responded with "No problem!" I hope they are always so supportive of each other! It made this momma's heart glad to see it. 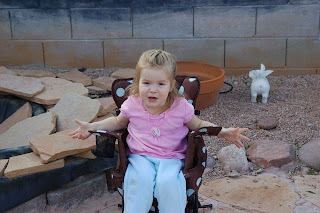 Wordless Wednesday brings a photo with no words! If you must tell your story, wait a day and play Tell Me Thursday! Before Christmas, I had posted about giving the kids coupons as a gift. I never got around to it then, but did make some coupons for Valentine's Day. I created a 2x5 table in Word and added Valentine graphics to each cell and printed the sheets. I gave each boy a sheet of coupons. Colin thought it was a neat idea right away, and ran off to fill his in. Nate wasn't nearly as enthusiastic, and grumbled that he would create coupons good for a "punch in the stomach." I called him on it, and teased him a bit, so by the time his dad came home he was denying that he would do that. I made coupons for the boys that included "One Day with No Chores! ", "One Day with No Schooling! ", and "A Lunch Date Just with Mom." Bo added a coupon for an afternoon alone with him for each boy. Lydia got coupons for reading 10 books and a lunch date. This morning, we all exchanged coupons (and a heart of chocolate candy for each child) and I loved the look on their faces when they saw what their coupons were good for. Definitely better response than any purchased gift would have gotten! And I was touched by the coupons they made for each other and us. Even Nate, who grumbled, created very thoughtful coupons for each member of our family. (He's a softie at heart!) They made coupons for Lydia offering to read her a book, and play anything. I got coupons for them to stay in bed, help cleaning my room, and chores with no complaining. It was a great exercise that brought in acts of service for each other. No money was necessary, just careful thought about what we could do for each other and what would be appreciated. I think I've started a new tradition, and I like it!! We finished the day with a yummy steak dinner, with bruschetta, green beans, roasted asparagus, mashed potatoes (made by Bo), and the flourless chocolate cake I wrote about last week (made by me). Everything was delicious, and the cake was divine. 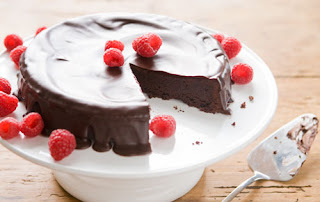 Rich, decadent, and one I plan to make again! 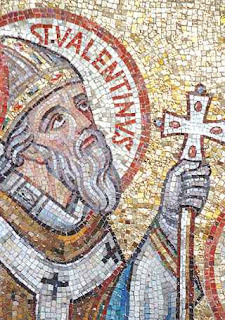 Lent begins next week, and I've spent a little more time than usual thinking about it before Ash Wednesday drops on my head. I ordered the book, Sacred Space for Lent 2010 , to give me some focus during the season. I ordered 2, and gave one to a friend. I thought we could encourage each other to read from it daily. When she asked me why I chose that one -- I answered honestly "The price . . ." (It's $2.50) But, now that I have it, I am glad I ordered it! There is only 1 - 2 pages per day of reading and I think it will help me focus this season. I also ordered Live Lent at Home: Daily Prayers and Activities for Families , in the hopes that it would help me guide the kids through the season as well. I've looked through it, and think it'll be a nice resource for my family. There are things to think about, and suggestions -- but none of it seems difficult to do with the busy-ness of a family going on. And, while there is no reason to purchase things for the season -- I made one more purchase for this Lent. As a family, we used to say a daily rosary fairly regularly. It's a habit we fell away from when I was pregnant and sick with Lydia and it's one we never picked up again. I miss it, and the boys do as well, so I purchased a rosary CD from the Desert Nuns that live near us. It includes all the mysteries, has some beautiful hymns sung, but my favorite part about it is that there is NO music behind the prayers. I have other rosary CD's, but there is always some sort of background music which is distracting to me, and makes it difficult to hear the prayer. (Since most rosary CD's have music, I am clearly in the minority.) We won't use it every day, but it will help us get back in the rhythm of daily rosaries. For almsgiving, the boys are going to ask for sponsors to donate money for each book read this Lenten season. We'll match the donations and send off a donation to Heifer International. We've also committed to donating 25 cents for each kind deed, so we're hoping that we're able to provide a few honeybee hives, or perhaps a pig to a needy family. I'll probably post about this project again, as we talked about it today but I haven't quite figured out all the details. And the final piece is sacrifice. Which I think is a rather private affair so I'm not going to share the things we've chosen to give up this year. What about you? Have you thought about Lent this year? What are your plans? I was surfing around this week trying to find a new recipe or two to try for Valentine's Day this Sunday. It'll be a family affair this year, and we look forward to cooking a nice meal together. Ever since I had the chance to visit Whole Foods before the holidays, I've been visiting their website regularly. I love all the great recipes they provide! The sweet PR person from Whole Foods happened to contact me this week, too, and offered another $10 gift card for one of my readers! For Valentine's Day, you can pick up a variety of natural and organic heart-shaped foods to celebrate. They have heart-shaped ribeyes, raviolis, and of course chocolates! For a chance to win, fill out the form and let me know about your Valentine's Day plans! I'll use random.org to choose a winner next Friday (February 19, 2010)! Disclosure: Whole Foods provided a gift card for this giveaway. No additional compensation was provided for this post. 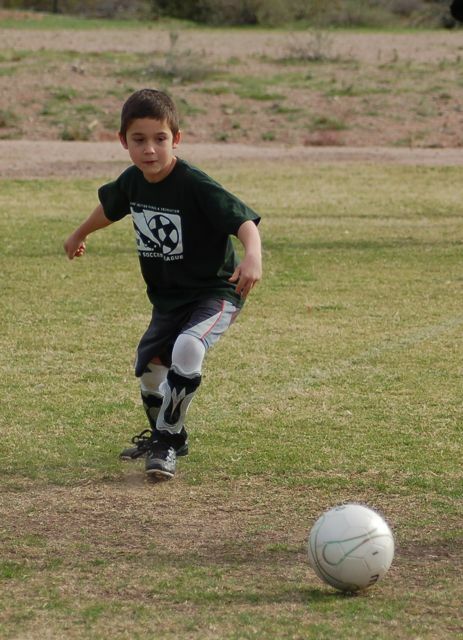 My Wordless Wednesday picture was of Nate on the soccer field last weekend. He truly loves to play team sports, and it's been great to watch him develop over the years. He is competitive, but at the same time he's a great sport! We have been so lucky with the Apache Junction city leagues for the past 5 years for baseball, flag football and soccer. I have heard about competitive and crazy parents over the years, but we have never encountered anything like that! Everyone, from the staff to the volunteer coaches to the other parents have been nothing but friendly, kind and helpful. Some coaches have been more skill-focused than others, but they have all encouraged friendly team play and good sportsmanship. My baby brother and his sweetheart are arriving tomorrow for a week + long stay. I'm very excited to see him, and my kids are beside themselves with excitement. They are calling tomorrow "Uncle Matt Day" in expectation of his arrival :) It should be fun! Okay, I guess that's all I've got. There are some un-bloggable things going on (yes, I know that's not a word . . . ) but as usual I'm sure we'll pull through and things will seem brighter in a week, or a month, or most probably a year or so! This summer, Bo and I will celebrate 15 years as a couple. In our early years, we worked together at our business, so we spent tons of time together and 98% of the time it was great. As the years have gone by, it's become harder and harder to find time to spend together . . . just us . . . without the kids, or smart phones, or exhaustion getting in the way. Some months we're better than others, but we both make a conscious effort to take time to connect with each other every day. It might be a text message, or holding hands during dinner, or a quick hug on the way out the door. Those times we're able to get away together for more than a few minutes hiding out in the backyard are truly special! In our busy lives, it's too easy to get wrapped up in the day-to-day details and lose sight of the big picture that is the rest of our lives. I'm committed to this man until I die and I never want him to doubt how important and special he is to me. I know I need to work harder at making sure he knows how important he is to me, and continue to develop and grow together as a couple. This Valentine's Day, we'll likely spend the day with our children - - but hopefully they'll go to bed early and allow us some snuggle time on the couch watching a movie. Sometimes it may seem common sense to take time for your significant other, but common sense isn't always the easiest to follow. It's worth the extra effort to be close to my sweetie, and I pledge to try harder. What do you do to keep the spark alive? K-Y currently has a contest for couples to be selected as "America's Top Couple" You can visit their Facebook page for information about the contest, as well as information about maintaining healthy relationships. Disclosure: I wrote this post while participating in a blog tour campaign by Mom Central on behalf of K-Y Brand and received samples of the Yours + Mine and Intense products. In addition, Mom Central sent me a gift card to thank me for taking the time to participate. Wordless Wednesday . . . if you MUST tell the story behind your picture, wait a day and play Tell Me Thursday ! About a month ago, I received a wonderful box of samples from Boogie Wipes. I had first seen Boogie Wipes a couple years ago, and I remember thinking "I'm not sure if there's a need . 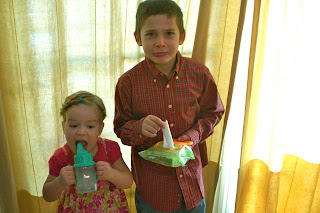 . ." but then my poor kids' noses were chapped and sore, so I gave them a shot. I really like them! They are a saline-moistened wipe, which is soft and gentle on the noses. There is no alcohol, and they are provide moisturizers from Vitamin E, Aloe and Chamomile. They are good-sized, but not too big . . . perfect for wiping sensitive noses without wiping the rest of their face as well. Before receiving the samples, I didn't realize they came in multiple scents. Lydia had a cold when the box arrived, and now she will only let me wipe her runny nose with grape-scented Boogie Wipes . She brings the package to me, or comes running up saying "I need Boogie Wipes, Momma! My nose needs Boogie Wipes!!" 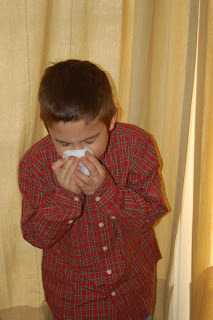 Of course, I got the cold next and completely fell in love with the menthol-scented Boogie Wipes ! Lydia doesn't like those at all, but Colin and I prefer them over all the rest. Nate is happy with grape or original scent. I had to work with that rotten cold, and they helped clear up my nose, as well as wipe it. Granted, it did wipe off some of my makeup as well, but nothing that a small touch-up in the ladies room couldn't fix. The fresh scent, which I had previously thought was their only scent is just that -- a very neutral, fresh scent. Boogie Wipes -Original Scent is the scent I see mostly in local stores, but it's worth it to search out the other scents! They come in individual wipe packets , which are great for throwing in purses and diaper bags, as well as pouches similar to travel baby wipes. 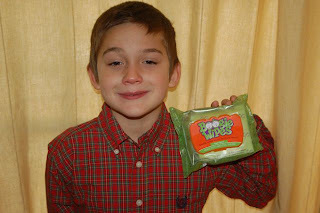 I've been handing out the individual wipes to my friends and everyone that has tried them has loved them just as I do! I don't go anywhere without some in my purse. You can visit Boogie Wipes at their own website , follow them on Twitter , and even become a fan on FaceBook! You'll find out about specials, giveaways and promotions by following them. Right now, there is a coupon available on their website. You'll find them in local stores (I've seen them in Target and Wal-Mart) and online at Amazon.com . Yea! Boogie Wipes were gentle on his nose! Disclosure: I received samples from Boogie Wipes to facilitate my complete and honest review. No additional compensation was provided. This is from our trip last month to the Grand Canyon. Thoughts from each child! Do you love Stacy's Pita Chips ? We especially love the crunch, and they are my go-to chip for hummus! I also like the cinnamon sugar ones as a sweet treat during that afternoon slump. They're a great chip to have at a party as well, which is why they came up with this fun sweepstakes for people to enter. If you visit their Facebook Fan Page, you can find the details for their Art of Game Day Sweepstakes! Starting this Sunday, February 7, 2010, you can upload YOUR pictures of creatively using pita chips during your football parties for a chance to win a $1,000 Stacy's Chips prize basket (including a year's worth of chips!) I can't wait to start checking out the pictures after noon on Sunday to see what people come up with! The great people over at Stacy's Snacks are sending me chips to sample this weekend, and generously offered to send one of my readers a sampling of Stacy's Pita Chips as well! This is going to be a quick giveaway so you can enjoy them as soon as possible! Disclosure: This promotion is solely sponsored by My Little Patch of Sunshine. Frito-Lay has provided the product for my use and for this giveaway. Lydia (my 2yo) loves to watch the shows on Sprout. Right now, they're running a great contest for kids who sing any of the theme songs for the shows on Sprout! You can video your Sproutlet, then upload the video at Sprout Online for a chance to win one of five iPod nanos! Lydia loves to sing and perform for the camera, but she's having a hard time choosing which song to sing for this contest! When she decides, I'll be sure to share it with you! Make a video of your 2 - 6 year old for your chance to win! I'd love to see your little one singing, so if you post it to the site, or to your blog, leave me a comment so Lydia & I can check it out. 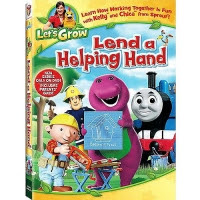 Sprout recently sent us the DVD "Let's Grow: Lend a Helping Hand " that has shorts from some favorite characters -- Barney, Thomas the Train, Angelina Ballerina and more -- that revolve around the theme of helping. Lydia has enjoyed watching this DVD and I'm excited to give one away to a reader! To enter, fill in the form and share your preschooler's favorite character by February 18, 2010! Extra entries for sharing this post or following my blog! Disclosure: I received a copy of the DVD for our review, and another for the giveaway from Sprout ! 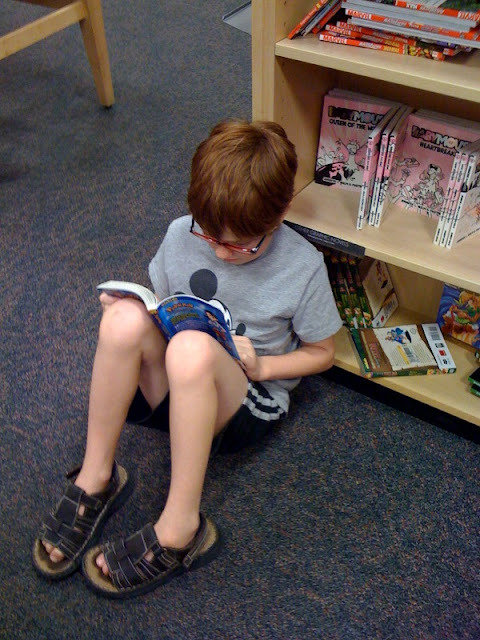 My Wordless Wednesday photo was of Colin, my 9yo, sitting at one of our local bookstores. 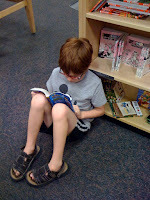 We were there because our library doesn't have any of the new Pokemon Anime series, and he loves to read them. I don't like to buy them, because he reads them in about 20 minutes and they are $7.99. On Sunday, my sister, Colin & I went to the bookstore. We left him in the graphic novel section and wandered around the store for about an hour to give him the chance to read 2 1/2 of his current series obsession. As we were leaving, I looked over and noticed how tall he has gotten! He suddenly seems taller and more mature than even a few months ago. He surprised me recently by changing his own sheets successfully, which prompted me to show him how the washing machine and dryer work so he can take care of his own laundry. I've realized lately that he is old enough to take on more complex chores with increased responsibility. He's always been one to help, but these recent strides in maturity are giving me a glimpse of the young man he's becoming. He tries harder to be cheerful about chores and schoolwork. He is kind to his siblings. He's intelligent and thoughtful. And the boy loves to read! He was so excited to receive a student dictionary today at his enrichment program, his teacher was prompted to admonish him not to read the whole thing before he got home! The back was full of interesting reference items and he spent the drive home sharing them. He will read just about anything -- so I don't mind allowing him to devour the occasional graphic novel -- I know his reading list is extremely well balanced! We enjoy sunshine more than 300 days a year in this part of Arizona. That is awesome, and I love it!! But, it means that sun protection is a necessity that has to be considered from a young age. I had the opportunity to review Julbo sunglasses for toddlers and infants and found them to be the perfect (and necessary) accessory for any child who spends time in the sunshine. Lydia is wearing a pair of pink Julbo Bubble sunglasses made for 3 - 5 yo. They are new for 2010 and they are adorable! The plastic frames are made from a durable plastic that is soft to the touch and fits her head snugly, but not uncomfortably. She can run around like the crazy child she is and they won't fall off! They are lightweight and I think she forgets she's even wearing them after a few minutes. She loves the color and I love the fact they wrap around her head to provide full protection of her eyes. 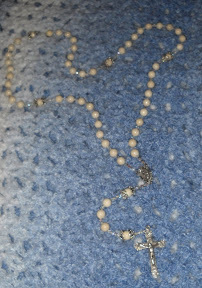 They come in a drawstring bag that makes them easy to find in my purse, and protects them from dust and cracker crumbs. Julbo is the only company that makes sunglasses for all ages. From a press release: "The Bubble boasts superior optical quality with Julbo’s Spectron 3 polycarbonate lenses that block 88% of visible light and 100-percent of harmful UVA, B and C rays. The Spectron 3 lens is incredibly versatile, making it suitable for use in intense bright light environments." 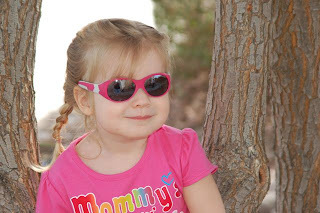 I also had the chance to review their infant style -- Julbo Looping Sunglasses . These have no hinges, a very soft elastic band to hold it on an infant or small toddler's head AND their frames are symmetrical so there is no wrong way to put them on! I wish I had known about them years ago when I struggled to find appropriate sunglasses for my kids. The sun protection of these glasses is "boasts Category 4 lenses, which block 100-percent of harmful UVA, UVB and UVC rays and also block 95-percent of visible light to protect baby’s sensitive eyes." which makes them a bit darker than the Bubble glasses. I highly recommend this brand because they provide a high quality product at an affordable price. We have gone through a couple pairs of cheap sunglasses, and these are far superior to those we picked up for less than $8. I plan to get a pair of Julbo Next Sunglasses for Nate, and wish they came in prescription options for Colin! Disclosure: I received 2 pair of Julbo sunglasses to facilitate my honest and complete review. Thanks to Julbo for sending them to me! Fiber One Yogurt Savings & Giveaway: $50 Safeway Gift Card! You can fill out the form multiple times with your entries, or you can do them all at once. I'll use random.org to choose a winner on Valentine's Day (February 14, 2010) so get your entry in by February 13! Disclosure: A VIP coupon, gift card, information and giveaway have all been provided by Safeway and Fiber One through My Blog Spark. Play along at Wordless Wednesday! If it's impossible for you to stay quiet about the story behind your picture, at least wait one day and play Tell Me Thursday! At the beginning of the year, I wrote about our plans to travel more as a family. We made that great trip to the Grand Canyon in early January, and I hope to make some sort of trip each month this year. If I was given an extra $100, I would put it into our travel fund to help us have a great time on our next trip! That money could be used for souvenirs, admission to a museum, or even a nice meal! I would break the $100 up into $10 bills so that it would feel like it was going farther! With 5 people, $100 would go pretty fast, but it would be fun to have the extra money to play with! What would you do? For my recent TV spot, I was able to look at some wonderful baby items. Unfortunately, I wasn't able to include them all in the spot, but I want to share the best with my readers! One of those beautiful items that I wasn't able to share on TV was this adorable, personalized blanket from Bubblecakes. I opened the box to find a cake box, beautifully wrapped with organza ribbon. I opened it to find the most precious patchwork blanket personalized for Lydia in a gorgeous font. Lydia has had a thing about rubber ducks for months now, and she loves the color red, so this blanket was an immediate hit! The blanket has a patchwork design with polka dot fabric, and duck fabric. It is backed by a fuzzy piece of chenille and bordered with a cute blue rick rick. It is beautifully made, and would make a cherished gift for any new baby! 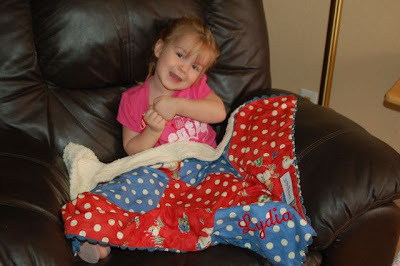 Lydia has been using hers as a car blanket to keep her warm, as well as a snuggle blanket in the living room. I've found her using it to carefully cover her baby dolls. A couple days after it arrived, she told my mom all about it over the phone -- complete to discussing the polka dots and how many ducks she counted on the blanket. She loves the fact that it is personalized with her name! Each blanket comes with a personalized diaper tag -- which we've used on Lydia's daycare backpack. I think that's a great gift that they include with each blanket! You can find all the unique patterns at the Bubblecakes website. Prices range from $25 - $65. Disclosure: I received a personalized blanket to facilitate my complete and honest review of this blanket. Many thanks to Jessica at Bubblecakes! 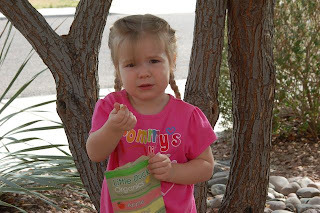 Lydia would like to offer you some of the yummy Little Duck Organics snacks we recently had the opportunity to review. The organic freeze dried fruit comes in 1oz packages that are yummy! They are a perfect snack for tiny fingers. These snacks contain NO added sugar, NO preservatives and NO artificial colors. Each 1oz bag holds about 2 cups, which is considered 4 servings at less than 20 calories. Did I mention they are also yummy?? They sent me enough for my kids to enjoy, as well as share with other local moms. Everyone who has tried them have enjoyed them! One friend took a bag with her on a recent flight, and said they were a lifesaver for her 18mo! They were the perfect size for her daughter to pick up and feed herself. They currently offer 3 flavors: Apple/Banana, Strawberry/Mango and Blueberry/Apple. You can find them at limited stores, but they are available at Amazon ! You can find out more about the company at their website, on Facebook, or follow them on Twitter. Disclosure: I received samples of this product to review. No other compensation was provided. Thanks again to Little Duck Organics!